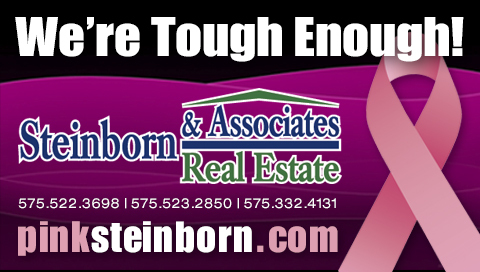 (LAS CRUCES) – Steinborn & Associates Real Estate launched their third annual internal fundraising campaign on September 17, 2013, with the help of the NMSU Aggies Are Tough Enough to Wear Pink (TETWP) campaign co-chairs. John and Amy Hummer challenged their REALTORS® and staff to collectively donate $6500, and in turn, they would match their team dollar-per-dollar up to an additional $6500. Thereby the Steinborn & Associates Real Estate team would make a $13,000 cash donation to the 2013 Tough Enough campaign. By close of business on October 16, 2013, the Steinborn & Associates Real Estate team raised $14,515.00 in cash donations and also gave $6,669.04 for in-kind breast cancer awareness promotions, making the total donation, $21,184.04! In 2011 their team raised $12,000 in cash donations and in 2012 they raised $13,900; each year growing upon the success of the previous year. The three year total is: $40,415 in cash donations and $27,613 for in-kind breast cancer awareness promotions, make the total donations from the Steinborn & Associates Real Estate team for the 2011-2013 campaigns: $68,028.86. “As a breast cancer survivor I donate to the TETWP campaign because I believe research is extremely critical to finding a cure,” says Mary Holliday, REALTOR® and three-year Steinborn campaign contributor.